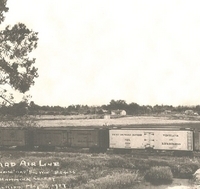 A Seaboard Air Line Railroad (SAL) train in Black Hammock of Oviedo, Florida, on May 25, 1927. The train was shipping Sunrise and Big Win brands of celery. Oviedo's earliest settlers grew citrus and celery on the area's mucky, rich topsoil. While citrus was the dominant crop for sometime, celery took the lead after the Great Freeze of 1894-1895, which destroyed many citrus groves in the Central Florida area. Oviedo's celery industry flourished, especially during World War II, and thus contributed to Central Florida's unprecedented growth and development during that period. Original black and white photograph, May 25, 1927: Oviedo Historical Society, Oviedo, Florida. Digital reproduction of Original black and white photograph, May 25, 1927. "Pioneer Town to Boom Town." City of Oviedo, Florida. http://www.cityofoviedo.net/ED/?page_id=12. Sloane, Margaret M. "Pioneer Town to Boom Town." The Orlando Sentinel, March 20, 1994. http://articles.orlandosentinel.com/1994-03-20/news/9403180306_1_grow-celery-mikler-pockets. 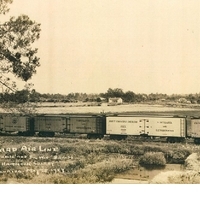 “Seaboard Air Line Railroad Train in Black Hammock.” RICHES of Central Florida accessed April 22, 2019, https://richesmi.cah.ucf.edu/omeka/items/show/5633.